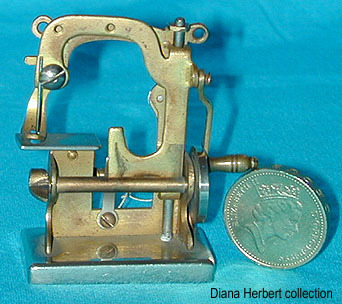 Miniature sewing machine - The Mini Tabitha. This delightful brass working model is based on the "Tabitha" design. Distributed as a ball favour in Vienna, Austria, the date of which had been ascribed as 1897; however recent research by Jurg Issler now indicates the relevant ball took place in 1888. Its diminutive size can be gauged from the size of the coin which has a diameter of 22mm.